What Could Industrial Hemp Mean for New Mexico Agriculture? Over the past decade, a dramatic shift in the debate over our relationship with marijuana (cannabis) has largely revolved around the plant’s recreational and medicinal uses. To date, twenty-nine states and the District of Columbia now allow medicinal marijuana in some form, and nine states (plus D.C.) have legalized the use of recreational marijuana. While the issue of marijuana decriminalization and legalization has received significant attention across the country, the legalization of hemp—a term used for non-psychoactive varieties of cannabis—has until very recently garnered far less notice from policy makers, media, and activists. Nevertheless, in September, a district court decision overturned one of Governor Susana Martinez’s vetoes from the 2017 legislative session to make New Mexico the thirty-fifth state to lift the ban on industrial hemp production. With New Mexico’s supreme court upholding that decision in April, the onus is now on the state’s Department of Agriculture to develop the rules and regulations that will govern the fledgling industry. In the meantime, hemp advocates are chomping at the bit to see the first fields seeded as they look to neighboring states and current growers for an idea of what industrial hemp production could mean for the Land of Enchantment. Despite the stigmas that continue to cloud opinions of hemp, civilizations from China to Egypt to England have cultivated the plant for thousands of years. Hemp rope had its origins in Russia more than 2,500 years ago and was used by the British Navy starting in the 1500s on the rigging of their ships. Hemp fibers were also employed to produce the cloth for the ships’ sails, and across the world, hemp was commonly used as a paper product. The United States has its own history of growing hemp. It was an early cash crop in the South starting in the late eighteenth century, and in addition to being used for paper and textiles, early Americans figured out how to burn hemp seed oil for fuel. Hemp seed oil was also used for a variety of medicinal uses including for pain relief, muscle spasms, and sleeping aids. In response to sensationalized fears surrounding marijuana use, however, Congress criminalized the plant in 1937. But during World War II, practical concerns trumped those cultural fears, and the federal government launched a “Hemp for Victory” campaign. With other textiles in short supply, the government recognized the need for additional raw materials to produce items such as clothes, rope, and parachutes, encouraging farmers to grow hemp to contribute to the war effort. Despite these practical uses and the long-standing tradition of growing hemp, following the war, the government only tightened its prohibition on all strains of cannabis, perpetuating the notion that there is little difference between marijuana and hemp. Despite attempts to conflate the two varieties of cannabis, they have fundamental differences. Both contain cannabinoids, compounds that exist naturally in cannabis plants. But while marijuana contains high amounts of tetrahydrocannabinol (THC)—the psychoactive component that produces a “high”—hemp contains little THC. THC levels in recreational marijuana typically range from fifteen to twenty-five percent, while hemp cannot legally contain more than three-tenths percent THC. Hemp can be bred to promote different qualities, such as longer fibers used in textiles, higher concentrations of seeds for nutritional supplements, or higher levels of another cannabinoid, cannabidiol (CBD), which has medicinal benefits but does not produce any psychoactive effects. Team at Wumaniti Earth Native Sanctuary (upper left, clockwise): Stephen Jacobs, Elliott Enos, Gemma Ra’Sta, and Tiana Suazo. More than thirty countries, including Canada, China, Russia, and Australia, permit hemp cultivation. For its part, in the 2014 Farm Bill, Congress eased the ban by allowing individual states to authorize industrial hemp programs regulated by their respective agriculture department or research university. Despite this reform, a legal gray area still exists because the federal government continues to classify hemp as a controlled substance. Much about the long-term prospects of hemp as a legal industry remains uncertain, but that has not prevented farmers from taking advantage of this new opportunity, and unsurprisingly, New Mexico’s northern neighbor Colorado is at the forefront of this burgeoning movement. Veronica Carpio founded Grow Hemp Colorado in 2014, following the Colorado legislature’s passage of an industrial hemp bill. Among other responsibilities, the organization advocates for good hemp policies, educates the public, and helps farmers network and find markets for their product. According to Carpio, the most difficult part for farmers is finding the seed. Because hemp cannot contain more than three-tenths percent THC at dry weight, there is a fine line for growers, with a great deal of risk if a crop goes “hot” and is above that threshold. A quick Google search will reveal many options for buying hemp seeds, but as Carpio suggests, “Question everything. Good genetics don’t come cheap.” Carpio has test results demonstrating the long-term stability of the seeds she sells and recommends that anyone buying seed also request to see test results demonstrating consistently low levels of THC. Growers also have the option of buying seed that has been officially certified, which carries a much greater degree of assurance that it will produce a legal crop. However, until last year, every strain of certified seed originated outside of the United States, making growers dependent on foreign competitors. In late 2017, Colorado’s Department of Agriculture certified a strain of hemp seed from New West Genetics, a Fort Collins based company. This could be a boon for the industry, especially in states like Washington and California, which allow farmers to grow only certified seed. New Mexico’s Department of Agriculture is still in the process of developing its rules and regulations, so it is yet to be determined if it will allow non-certified seed. If so, will it honor Colorado’s certification process or require that seed to be separately certified in New Mexico? Michael Chappelear, who founded the New Mexico Hemp Association in 2014 to help advocate for its legalization, worries that transporting seed across state lines could raise the ire of the federal government and suggests that it could be safer for farmers to import their seed from Europe, where most certified seed originates. “It’s almost as if they’ve put it on each and every state to reinvent the wheel,” says Chappelear of the legal limbo created by the federal government. Hemp tolerates both cold and heat well, so New Mexico’s high desert climate with warm days and cool nights can be well suited for hemp production. Chappelear also stresses the importance of going organic. Hemp will absorb whatever is in the soil, so for a crop destined for food or nutritional products, the soil must be free of any harmful chemicals. On the flip side, however, Ra’Star heralds hemp’s ability to clean up soil and thinks it could be potentially useful in agricultural fields contaminated from a legacy of mining chemicals, pesticide use, or fuel spills. According to Ra’Star, for hemp used in textiles or products like hempcrete, the trace amounts of contaminants will not be harmful. Left: Hemp seedling. Right: Ra’Star in Wumaniti greenhouse. However, according to Ra’Star, Wumaniti has had plenty of interactions with law enforcement, but has never had a problem. This, she attributes to the fact that they have always been transparent and welcoming with the communities where they farm. To help normalize the idea of hemp cultivation, Wumaniti also offers tours of their farms and invites community members to help harvest at the end of the year. This idea of involving the community is central to the way Wumaniti runs the business side of its operation. It’s not just about growing hemp, but about empowering local farmers and using hemp to boost the local economy by finding innovative ways to put the plant to work. 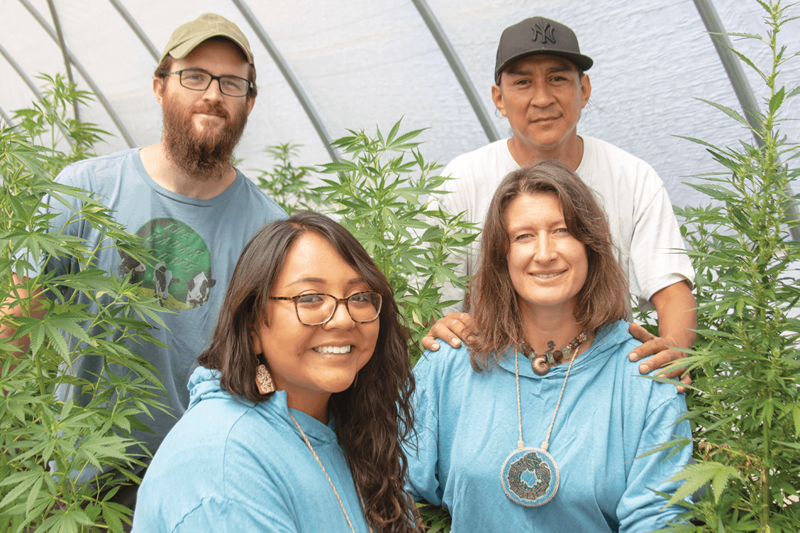 At its two retail stores in Taos and Santa Fe, Wumaniti sells sixty-one products, the majority of which are made with hemp grown in New Mexico. These include clothing, teas, balms, oils, protein bars, and dog treats. Ra’Star and her co-founder, Elliott Enos, of Taos and Tesuque Pueblos, have also been experimenting with hempcrete as a building material and will be opening a hempcrete store adjacent to their current location in the Santa Fe Mall. Some of their members are already building with the flame-retardant material, and the store will display hempcrete domes to help introduce people to the concept. Hemp cultivation in New Mexico holds significant potential, but much about the fledgling industry has yet to be determined. New Mexico’s Department of Agriculture is in the process of writing rules for licensure, inspection, record keeping, fees, and law enforcement. According to a spokeswoman for the department, it hopes to present its draft regulations to the Board of Regents sometime this fall. If all goes according to plan, it is possible that farmers could be growing hemp by 2019.